Get the Starter Package of Beginning AutoHotkey Books in All Three E-Book Formats ($35.90 Value) for Only $19.95! That's a Savings of Over 44%! Add Jack's Motley Assortment of AutoHotkey Tips Bundle ($27.99 Value) to this beginning bundle for only $15! Use the Coupon Code "MOTLEY" at check out to get the discount. Don't Know Where to Begin with Novice AutoHotkey E-Books or Which E-Book Format is Best for You? Get These Beginning Books in All Three Formats in One Starter Deal! This bundle includes each of Jack's beginning AutoHotkey books in all three digital formats: EPUB format (iPad, Nook, Kobo, etc. ), the MOBI format (Amazon Kindle) and the Adobe PDF format for printing on letter size paper and putting in a notebook for easy review and notetaking when away from your computer or other reading device. The ComputorEdge AutoHotkey Library offers bundles at a special low price for Jack's books for people who want beginning, intermediate, or all the volumes in all three formats: the EPUB format for an iPad, Android device, or PC, MOBI for Amazon Kindle, and PDF format for printing and inserting in a reference notebook. When you purchase a bundle, you automatically register as a member of the ComputorEdge AutoHotkey Library. If you have any questions. please contact me." For benefits details of your ComputorEdge AutoHotkey Library Membership, see "Jack’s AutoHotkey E-Book Library." 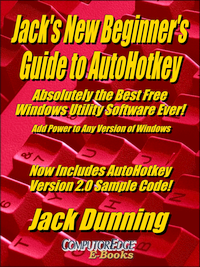 Jack's New Beginner's Guide to AutoHotkey (Second Edition 2018) Completely rewritten, this new Beginner's Guide offers more tips and insight into how to make AutoHotkey work for your Windows computer. For anyone new to AutoHotkey and script writing, this book offers an easy approach to learning how to add more power to your Windows PC. For Windows XP, Windows Vista, Windows 7, Windows 8 and Windows 10, AutoHotkey is the most powerful, flexible, free Windows utility software available. Anyone can instantly add more of the functions that they want in all of their Windows programs, whether installed on their computer or while working on the Web. AutoHotkey has a universality not found in any other Windows utility--free or paid. Now includes peeks at the future AutoHotkey version 2.0 code and two new chapters on AutoHotkey Windows program automation. 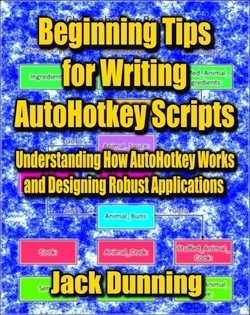 Beginning Tips for Writing AutoHotkey Scripts: Understanding How AutoHotkey Works and Designing Robust Applications Jack wrote this book, not as a tutorial, but as a guide to understanding how AutoHotkey processes scripts and how you can better design applications. For many new AutoHotkey users, the actions AutoHotkey takes when loading a script appear enigmatic causing unpredictable results. While initially many features may not seem to add up, AutoHotkey reads a script in a way that makes total sense—once you comprehend it. You'll find understanding how AutoHotkey gets things done critical to writing and debugging robust scripts. 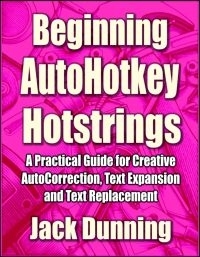 Beginning AutoHotkey Hotstrings "A Practical Guide for Creative AutoCorrection, Text Expansion and Text Replacement" Hotstrings are only one piece of the extensive AutoHotkey Windows scripting language, but if you're a writer, editor, programmer, or word processing professional of any type, then you have a reason to use AutoHotkey Hotstrings. Whether you need to AutoCorrect your writing in any Windows application or on any Web site; want to quickly expand abbreviations; create menus of options for text replacement or build lists of business or professional jargon for quick insertion, AutoHotkey is the ticket for you. 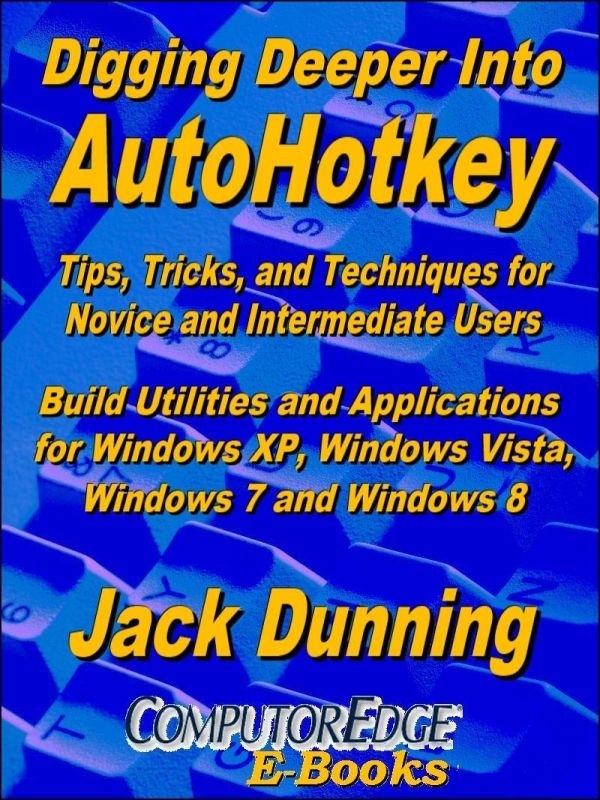 Digging Deeper Into AutoHotkey Jack's goal in this book is to help the novice and intermediate scriptwriter grow more familiar with AutoHotkey and its power through demonstrating real-world applications. The more someone understands the nuances of a scripting language, the easier it is to write simple applications. While the AutoHotkey Command listings on the Web technically give you everything that you need to write a script, the commands don't always work the way you may expect. Jack has tested everything in this book and explains how each script actually works (plus he highlights his mistakes with those commands). 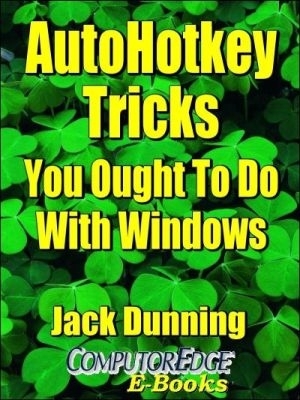 AutoHotkey Tricks You Ought to Do with Windows AutoHotkey Tricks offers tips and tricks, but just as important you'll find all the other Table of Contents and Indexes from all of the other AutoHotkey books. This makes a handy reference when determining which book has the answer you want. This book is a quick start for people familiar with script writing or anyone else who want to see what's possible with AutoHotkey. For Windows XP, Windows Vista, Windows 7, Windows 8 and Windows 10, AutoHotkey is the most powerful, flexible, free Windows utility software available. Anyone can instantly add more of the functions that they want in all of their Windows programs, whether installed on their computer or while working on the Web. AutoHotkey has a universality not found in any other Windows utility--free or paid.